5 Question Friday With Tacoma’s SONICS GUY! For this week’s 5 Question Friday I have Kris Brannon. 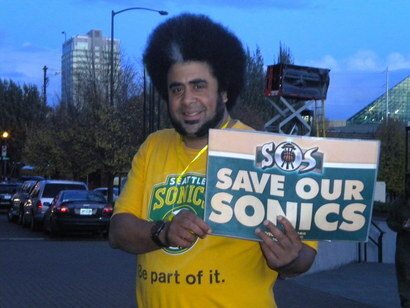 Kris has been a stand-up comic for the past few years, but he is better known these days as SONICS GUY. I’d do a further introduction, but Sonics Guy does a pretty good job of that himself. 1. You are Tacoma’s ‘Sonics Guy’. What does that mean? As Sonics Guy, I work to make sure that no one forgets that the NBA left Washington because certain politicians and businessmen chose their own interests over those of the citizens of Washington. I meet people every day that feel as angry as I do that our premier championship team is no longer. Notice the articles printed in local papers when the Thunder does well – how people feel cheated and say “that should have been us.” The team I loved from my childhood is gone and I’m not the only one that misses them. 2. What is your intent with the petition? The intent of my Initiative I-1158 is to force politicians and business interests to address and solve the problem of getting an NBA team back in Washington. Face it, most people don’t even know the state song – I learned it in fourth grade and haven’t heard it sung since. Do you know it? Sir Mix Alot’s “Not in Our House” was the Sonics’ theme song, everybody knows it and everybody knows it symbolizes the importance and popularity of NBA basketball in Washington. 3. Why does a guy from Tacoma care about a former Seattle NBA team? The Sonics are and were bigger than any one city — they are Washington State’s team. When I cheered for the Sonics I wasn’t cheering for Seattle, I was cheering for every one of us in this state. People from around the region thought the Sonics were their team. Don’t forget that they havent always been in Seattle — during the Key Arena remodel they played a year in Tacoma at the Tacoma Dome. I got a job down there as I wanted to work the games. Most of the season ticket holders were from Bellevue, this wasn’t just Seattle team, it was everybody’s team. 4. What can other Tacoma residents do to support your cause? People can go my website Sonicsguy.com to contact me directly, follow me on Twitter (@sonicsguy), follow me on my Facebook fan page (Sonics Guy) and hit the “like” button. Tell your friends and family about the initiative, and, if you see me around town and are a registered Washington voter, SIGN THE PETITION! I would also appreciate having permission to put up petitions on the premises of local businesses. 5. What’s next for Sonics Guy? Well, until July 8th, the last day to submit signatures to the Secretary of State, its all about I-1158. After that it will be about going to any event I can big or small to extoll the virtues of the Sonics and having NBA basketball back in Washington State. Remember the green and gold always!!! This entry was posted in 5 Question Fridays, Tacoma stuff and tagged Kris Brannon, Sonics Guy. Bookmark the permalink.